Gateshead had the better of the first half scoring three unconverted tries without reply for a 15-0 lead at half time. Barnard Castle came back strongly in the second half pinning Gateshead down in their own half for long periods. The Barnard Castle pressure was rewarded by scoring to converted tries which brought the score to 15 – 14 with ten minutes left to play. Despite Barnard Castle last ditch attempt to get a winning score it was Gateshead that I presented the cup to after the final whistle. Mention must be made of the large crowd for this match; it is good to see the county cups being so well supported. 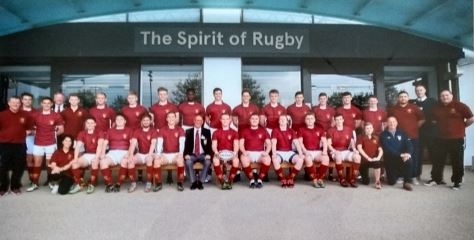 On Friday I travelled with the County under 20 Squad for their County Championship Final against Yorkshire, to be played at Twickenham the following day. At Twickenham the Durham officials and I were hosted by the RFU President Peter Baines, Senior Vice President John Spencer and Junior Vice president Chris Kelly. On the pitch before the match the RFU President, the Yorkshire President and I were introduced to the players from both sides and the match officials. Yorkshire had the better of the first half and lead 8-0 at half time from a try and penalty goal. Strong defence from the Durham boys meant that the only additional scores from Yorkshire was two further penalties to stretch the lead to 14-0. Durham where coming more and more into the match and with fifteen minutes remaining scored a converted try. On three occasions only last ditch tackles by Yorkshire prevented Durham from scoring. Yorkshire hung on to the Final Whistle to beat the gallant Durham boys 14 – 7. The Durham boys can be proud of their achievements playing at the top level of this championship after gaining promotion last season. To reach the final they had beaten Yorkshire I their only home tie and had to make long trips for both the quarter and semi-final matches. At the post match meal and speeches I was presented with a framed photo of the Durham players and officials that had been taken to mark to occasion earlier in the day. Well done to the county U20’s, they played some excellent rugby. Big games from all the current and former Hartlepool 6th form players. As for the picture at Hollow Drift, that really is an ugly Gargoyle.